Using some part of the cloud—whether AWS, Azure, Google Cloud, or others—has become a standard part of modern web development. RightScale’s 2018 State of the Cloud reported 97% of respondents using at least one cloud service. In most instances, it’s easiest to buy into one cloud ecosystem so you have fewer things to manage. But when prices of a service increase, the platform changes, or you need to add an outside service to the mix, how do you handle switching one service from your vendor-locked cloud, let alone several? 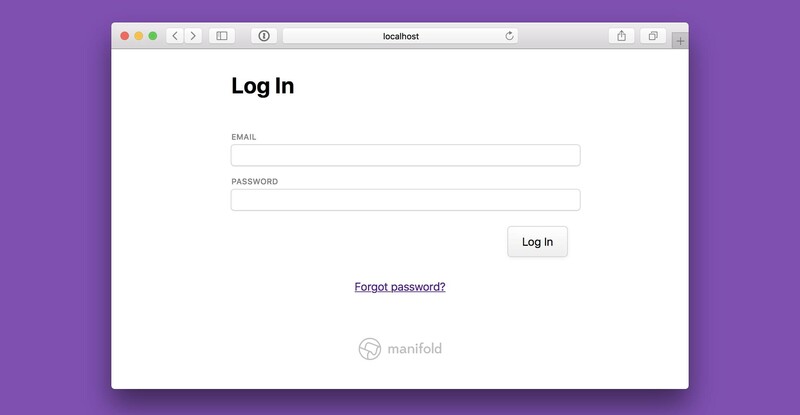 Manifold’s free developer tools provide everything you need to build-your-own cloud from existing providers. To see how, I’ll be taking an example application with authentication, hosting, and account email services, and moving the app off AWS and onto independent providers for all three parts. You can see the code for the starting application here, in the master branch. The credentials for the services are all fed in via environment variables through a .env file. Though the values aren’t saved in the app, you can see all the variable names needed in the .env.example file. With Manifold, you can hook up any service you want—even those not listed on the Services page! But for this example, our usecase is satisfied by the existing services of Mailgun and JawsDB Postgres, so we’ll use those two. But again, once the application uses Manifold, those can be swapped out easily at any time. Note: you can read more about this install script on the Manifold CLI Guide. Then, log in with manifold oauth -- github if you registered via GitHub, or manifold login if you signed up with email / password. Now comes the fun part! Adding resources with manifold create couldn’t be easier. If you like what you see, we’ve released promptui as OSS! For JawsDB, selectjawsdb as the service type, and kitefin for the lowest-cost plan (you can adjust the plan later from the Dashboard). Complete the remaining prompts like region and name with whatever you wish. Pluck apart those values from the URL into .env to swap your app. You’ll likely see some errors like ERROR: role does not exist because of username differences, but it should succeed nonetheless. You can verify by running psql $JAWS_DATABASE -h $JAWS_HOST -U $JAWS_USER and \dt to show a list of tables. You can follow up with a query to double-check the data made it (e.g. : SELECT * from users;). Migrating our database was about as easy as it gets, but not all service-swapping is quite as rosy. To switch from Mailgun, we will have to modify app code a bit in addition to a simple .env update. Add Mailgun to your Manifold account, either through running manifold create locally, or via the Dashboard. Their free tier is perfect for testing. 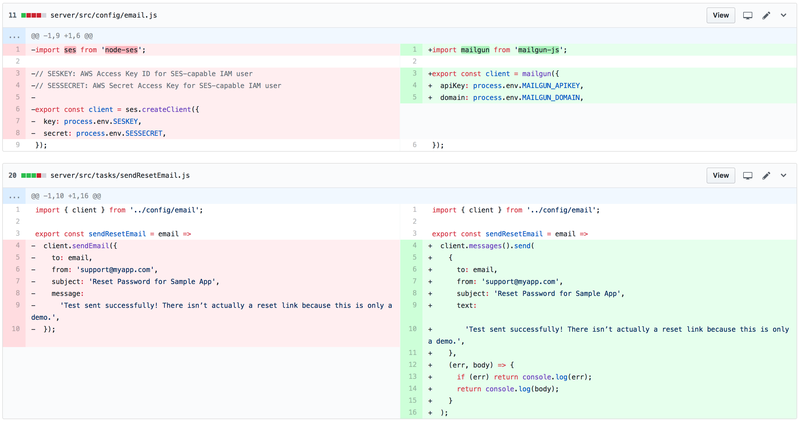 Then in our email config, we’ll make a few changes that swap out the SES client with Mailgun’s (you can see the diff on the Pull Request from the sample app). Overall, not too bad! The API, fortunately for us, ended up being similar. We only renamed two env variables—so as to not be confusing later— and had to change message to text in our email call. 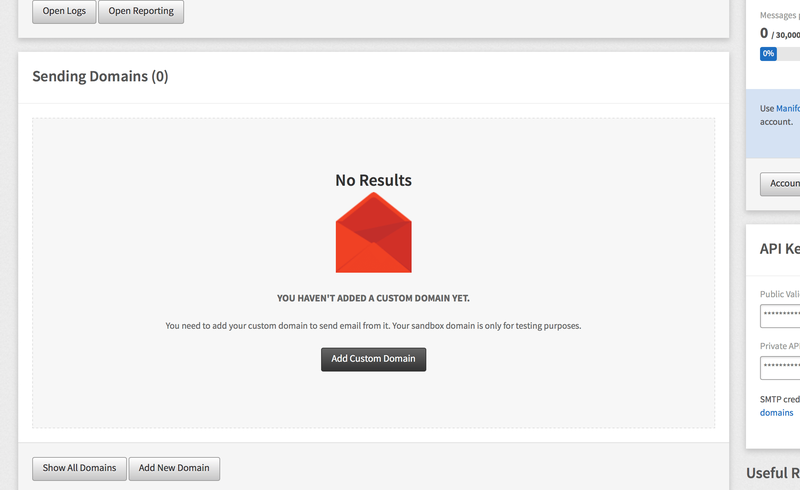 Once some test emails are sent, we’re pretty much in business! If you use cloud services that work on any host, you can deploy to any host at any time. “Duh,” you’d say. And you’re not wrong! But it’s not bad advice to keep in mind, either. The biggest advantage to projects, besides organization, is one-click .env file downloads. Clicking either the “download .env” or “Show credentials” buttons will yield all values for all resources in a project. Huge time-saver when it comes to updating access tokens! If you want to make it even more secure and load secrets from memory, try using manifold run to start your app—you can inject env vars directly from Manifold without any of them living in your file system! The sample app has an example of how to do this in package.json. And then you can run manifold projects create from that new team context to create a project for that team (currently, you can’t convert an individual project to a team project, but it’s not too bad to move existing resources from an old project to a new one—you don’t have to start from scratch again). Migrations may not ever be fun, but with tools like Manifold’s CLI it can come pretty darn close. The best migration may be none at all, but when the time inevitably comes, Manifold makes it as painless as it possibly can be.